One of my favorite things to do is mix ingredients and flavors and come up with new easy throw together recipes. This dish is one of them. The process is so simple yet the outcome is elegant and very flavorful. 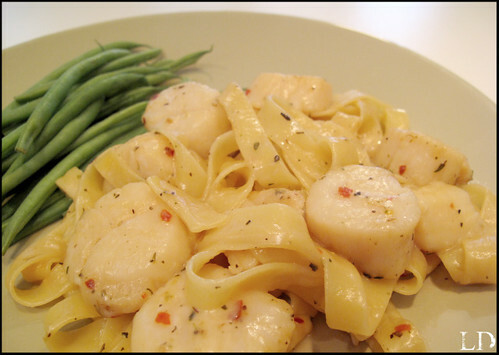 The scallops are the main focus of this dish, and are buttery, tender and full of their own natural flavors. Cook your noodles according to the package and set aside. In a medium high skillet melt your butter add your olive oil. Add your scallops and letting them sear for about 2 minutes. Add your seasoning, more or less can be added depending on your taste. Let the scallops cook for another 2 minutes. Add the white wine, degassing the pan, then slowly add your cream. Stir all together, add your pasta to the pan. Let your sauce thicken, serve hot. yum! I've been waiting to see another recipe. I love to visit regularly. Hope all has been well for you. Just made scallops last night for dinner at my house- my husband grills themwith a citrus dry rub- FANTASTIC. Yum! Scallops are my absolute fave!